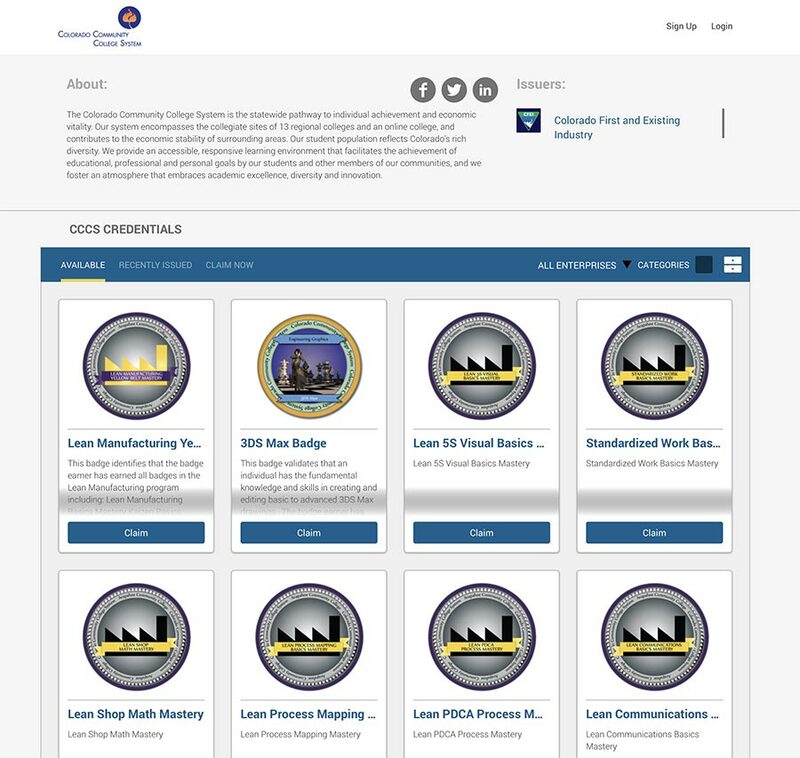 CCCS is a national leader in offering a new way to display industry-recognized, employment focused credentials that validate core employability and technical skills for all Industries – Digital Badges. The associate degree is most often awarded to students completing educationally broad based post secondary programs usually requiring two years of full-time study. In some instances, particularly allied health programs, three years is the norm. For students who need developmental/remedial coursework, the time will be extended since these credits will not apply toward the associates degree. The Open Badge Standard enables the badge holder or badge viewer to verify the skills and mastery through verified organizations attaching data and evidence of skill attainment to the the badge image file, hard-coding the metadata for future access and outside review. They are graphical images representing expertise and accomplishment(s) backed by verified metadata by trusted issuers. CCCS offers more than 85 badges. ?What is a Digital Badge? A digital badge is a digital representation of a skill, learning achievement or experience. Digital Badges can represent competencies and involvements recognized in formal or informal learning. They can support learning that happens in new ways, in new spaces beyond the traditional classroom, from online courses to training programs to work and life experience. This motivates learning and signals achievement across communities and institutions. It also provides a more complete picture of learners' skills, achievements and qualities, which can then be communicated to potential employers, educational organizations and communities. Each digital badge is associated with an image and some metadata. The metadata provides information about what the digital badge represents and the evidence used to support it. Earners can display their Digital Badges online and can share digital badge information through social networks. Core components of a badge include the information needed to determine its validity, authenticity, source, and value. This includes the recipient (who earned the achievement), the issuer (the individual or organization taking responsibility for issuing the badge), the badge’s criteria and description (what the recipient needed to do or demonstrate to earn the badge), evidence (an authentic representation or connection to the underlying work performed or contribution made to earn the badge), a date (precisely when the badge was awarded), its expiration (when, if ever, the credential bestowed is no longer valid), and a certificate or assertion (a connection to an official form of verification vouching for the validity of the award). ?What do Digital Badges do? Digital Badges can capture a wide set of skills and achievements. Digital Badges create a more complete representation of an individual's learning and experience. Earners can group Digital Badges into collections for sharing through particular channels. Digital Badges unlock new career and learning opportunities, potentially allowing employers and other stakeholders to better match individuals to jobs, courses and projects. 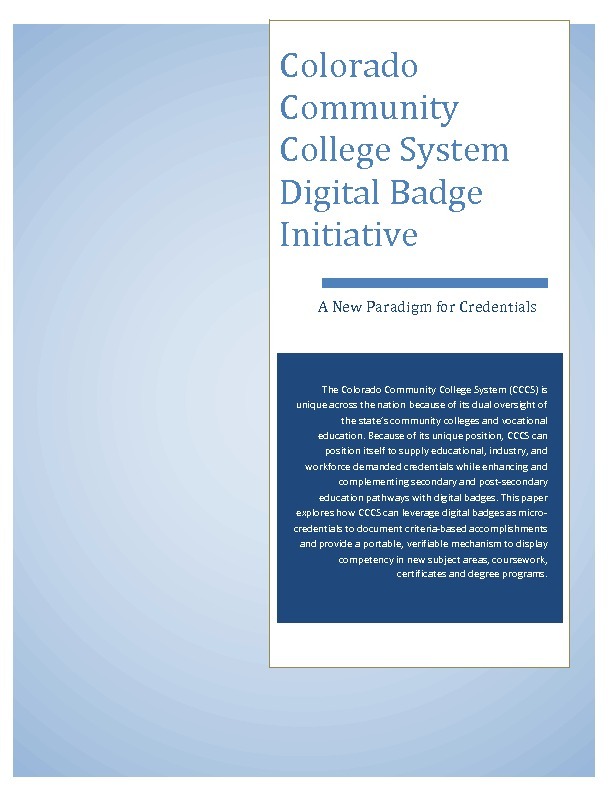 ?How does the CCCS digital badge hierarchy work? Expert Badges – are issued to expertise in an area. They include a series of criteria/competencies that need to be met. Skill Badges have complex criteria and do not apply to a single achievement or event and are building blocks for Mastery badges. They can be earned individually, or grouped together to earn a Mastery badge. Expert Skills: The expert is able to see what needs to be achieved and how to achieve it. Able to apply knowledge in different areas. Tailors an approach and method to each situation based on an elevated skill level. Mastery Badge – involve the development of a skill within a set pathway, indicating by default, completion of all Expert Skill badges within a pathway if appropriate. The Mastery badge is earned when the entire criteria curriculum has been completed, assessed and evidence of competency is produced. Mastery Authority: The master has developed superior standards and effectiveness of knowledge. Syntiesis of knowledge and skills to critically think through problems, generate multiple solutions and evaluate solutions for appropriateness. Ability to transfer knowledge to others. Utilizes extending expertise within a domain with their own synthesis of tools and methods. Ability to teach or train other to become an expert. ?Why do we Need Digital Badges? In today’s world, learning happens anywhere and everywhere. Despite increased opportunities for learning, there’s still an essential piece missing – we need formal recognition for these newly earned and hard-won competencies and skills. In general, résumés are static in that they need to be updated and re-published. Digital Badges can be more dynamic – new skills, competencies and knowledge are automatically published, and updated, after the digital badge is issued. In other words, Digital Badges can represent the same skills and experiences a résumé represents, plus a lot more, as well as generally providing a richer level of detail. Digital Badges are also discover-able in a variety of online contexts, so earners can share them in different ways. Once earned, you can share digital badges on your resume, e-portfolio and social networks. Badges are clickable, linking through to where they are officially stored in Credly Digital Badges or Mozilla Backpack. This allows others to see the details of your competencies and verify their authenticity as credentials. ?What are the benefits of Digital Badges? Provide a more complete picture of the learner - Digital Badges give a more detailed, granular skills and learning history; allow a more granular recognition of specific skills than a traditional degree or certificate; allow specific recognition for "soft skills," social habits, ability to collaborate and can measure and recognize skills that are valuable in many contexts but that traditional educational models do not even attempt to quantify. Signal achievement and motivate participation - Digital Badges signal skills and achievements to peers, potential employers, educational institutions and others while providing learner feedback and milestones throughout a course or learning experience, encouraging engagement and retention. Allow multiple pathways to learning - being open and inherently flexible, Digital Badges encourage earners to take new paths or spend more time developing specific skills. Capture the learning path and history - Digital Badges can capture a more specific set of skills and qualities, dated as they occur along the way using issue dates. This means we can track the set of steps the most successful learners take to gain their skills - and replicate that experience for others. With Digital Badges, earners will be able to carve out their own pathways, learning more about their own skill-sets along the way. Recognize new skills and literacies - a host of new literacies are critical to success in today's digital world (e.g. appropriating information, judging its quality, multitasking and networking) - these are not typically taught in schools and don't show up on a transcript. Digital Badges can recognize these new skills and literacies. Open doors - Communities of Practice, Professional Associations or Specialized Groups could require obtaining a set of Digital Badges to gain access. For this reason Digital Badges are used to implement CPD (Continuing Professional Development) in certain industries. Enhance identity and reputation - Digital Badges raise the earner's profile with the learning community and peers, giving the individual control over their online identity. The portable nature of Digital Badges also allows the earner to aggregate identities across communities. Provide branding opportunities for institutions, organizations and learning communities - Digital Badges can be displayed in many locations throughout the Web. Increasing awareness of your institution, organization and learning community, as well as linking relevant curriculum, skills and knowledge. Build community and social capital - Digital Badges can help earners to find peers or mentors with similar interests. Community Digital Badges help formalize camaraderie, team synthesis and communities of practice while enhancing the potential to open up learning and career pathways. Work within various different types of system - Digital Badges are open and inter-operable, which means stakeholders in a badging system can use whatever technologies they want or need, implementing badging within existing systems and choosing freely to utilize badging in whatever way suits their own community of digital badge earners. ?What kinds of skills and accomplishments can Digital Badges represent? Anything else - Digital Badges are open, so their potential to represent varied skills and experiences is unlimited. ?How different are Digital Badges from the information provided in résumés? In general, résumés and CVs are static in that they need to be updated and re-published. Digital Badges can be more dynamic - new skills, competencies and knowledge are automatically published, and updated, after the digital badge is issued. Digital badges with well-defined criteria can be very useful in a hiring process. A single well known or well-understood badge can represent many bullet points of requirements on a job description. In other words, Digital Badges can represent the same skills and experiences a CV represents, plus a lot more, as well as generally providing a richer level of detail. Digital Badges are also discoverable in a variety of online contexts, so earners can share them in different ways. Because digital badges enhance traditional credentials, they are often referred to as “stackable credentials.” These stackable credentials help demonstrate competencies that employers value most. As a stackable credential, a digital badge will highlight the specific competencies that employers expect and require from new hires. In this way, candidates can demonstrate that they have the perfect blend of skills needed to thrive in the workforce—not just that they passed a certificate program. These credentials also help current employees add to their qualifications by showcasing professional development that has taken place since being hired. ?What form do Digital Badges take? Do I stick it on a Web page or sew it on my shirt? A digital badge is more than just a static image - its value comes from the information or "metadata" attached to it. This supporting data contained within the digital badge reduces the risk of abusing the system (e.g., illegitimately copying Digital Badges and putting them on your site) and builds in an implicit validation system. 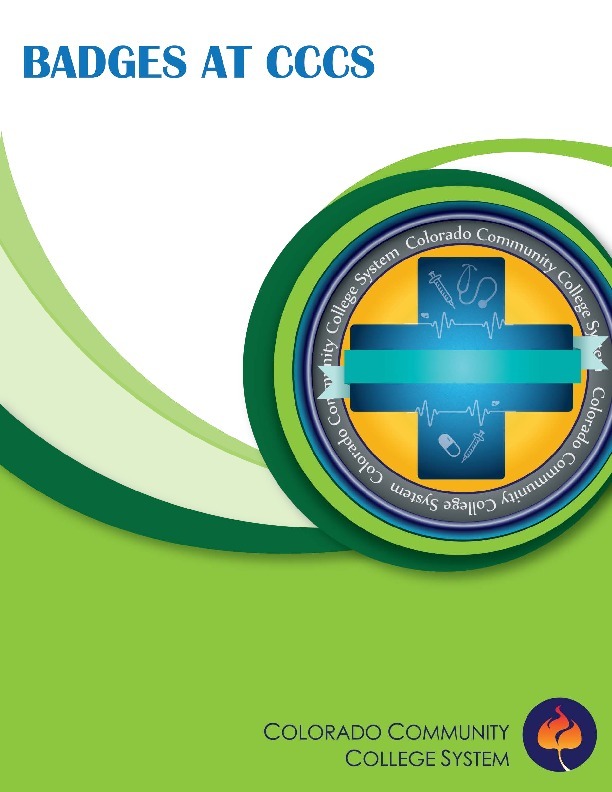 Sign-up or login to your account at CCCS badges on the Credly badging platform to acquire your badges.